We accomplish your Transponder & Altitude encoder tests using the latest "state of the art" test equipment from Aeroflex, the IFR 6000. In addition we are certified for installation, repair, and calibration of all models of transponders and altitude encoders. All work is accomplished by an FAA certified AP-IA mechanic (not all repair stations use certified mechanics). Transponder tested for proper operation per CFR Part 43, Appendix 'F'. Automatic Altitude encoder Data Correspondence test per CFR 91.217 (required for new installations or when altimeter or altitude encoder is repaired/replaced). More info can be found on our FAQ page. We use the Aeroflex IFR 6000 to test all modes of transponder operation including Modes: A, C, S, Altitude reporting, ADS-B in/out, UAT and DME. Altitude data is supplied to the transponder from the altitude encoder or digitizer which then transmits that information to ATC, this altitude is displayed on the IFR 6000 during testing. 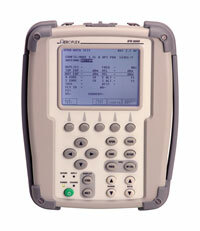 The accuracy of the IFR 6000 enables us to easily meet or exceed all manufacturer specifications. (b) All airspace. Unless otherwise authorized or directed by ATC, no person may operate an aircraft in the airspace described in paragraphs (b)(1) through (b)(5) of this section, unless that aircraft is equipped with an operable coded radar beacon transponder having either Mode 3/A 4096 code capability, replying to Mode 3/A interrogations with the code specified by ATC, or a Mode S capability, replying to Mode 3/A interrogations with the code specified by ATC and intermode and Mode S interrogations in accordance with the applicable provisions specified in TSO C–112, and that aircraft is equipped with automatic pressure altitude reporting equipment having a Mode C capability that automatically replies to Mode C interrogations by transmitting pressure altitude information in 100-foot increments. § 91.217 Data correspondence between automatically reported pressure altitude data and the pilot's altitude reference. (b) No person may operate any automatic pressure altitude reporting equipment associated with a radar beacon transponder or with ADS–B Out equipment unless the pressure altitude reported for ADS–B Out and Mode C/S is derived from the same source for aircraft equipped with both a transponder and ADS–B Out.